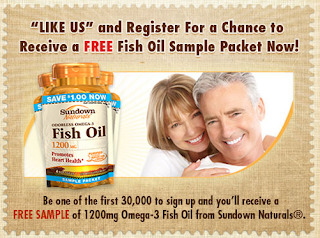 Sundown Naturals is offering a FREE Fish Oil Sample Packet. To get yours, "like" them on Facebook and click "Fish Oil Giveaway" on the left side of the screen to request your free sample of 1200mg Omega-3 Fish Oil. This offer is limited to the first 30,000 requests.